Due to the vast numbers of sufferers of aerophobia worldwide there is an abundance of available clinics and courses that claim to help overcome this fear. Many will have good success rates though there may be some that are not run by professionals or who have no real experience or knowledge of this subject. Courses can be followed at home, at a clinic or a combination of the two. There are many adverts on the internet, in magazines and in newspapers that offer home run courses aiming to cure phobias. Many of these use the help of CD’s, DVD’s or books, some are now even fully downloadable to your PC. The vast majority of these courses use hypnotherapy, relaxation, self-esteem and self-confidence building techniques to help overcome the problem or reduce the level of anxiety experienced. They may be useful for many, especially those who are firm believers in hypnotherapy and have used it before to help them with a problem. Whilst these home courses may work for some, they do not actively try to discover the root of the problem and determine the cause. To opt for a clinic based treatment will either require a single visit or a course of many appointments. These clinics are usually run by mental health professionals who are experts in their field and use a combination of techniques tailored to each individual person’s needs and intensity of the phobia. Many begin with a telephone enquiry during which a short assessment may take place to help the clinic suggest an appropriate course of treatment for the sufferer. Following this a visit will normally be made to the clinic, or in some cases, the therapists will come to the sufferer, where an initial treatment will be performed. This may be hypnotherapy, relaxation exercises or involve some of the techniques used in psychotherapy. The therapists and client will work together to gain the most benefit from the session and will both evaluate its success at the end and determine whether future visits will be needed. Once the visits are no longer required, there is often post-therapy telephone or email support available. Courses can be followed using either a psychotherapist, by an airline or using a counsellor. Psychotherapists will perform an assessment of the sufferer and his or her background and devise an appropriate treatment plan for them. Using cognitive and behavioural therapies they seek to fully understand the thought process of the individual and try to reorganise thoughts and reactions in a more positive and realistic way, aiming to reduce anxiety and lessen negativity. 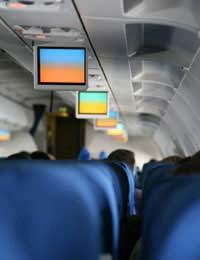 Many major airlines now run courses that incorporate many different therapies, namely psychotherapy techniques, counselling and relaxation exercises. They usually use professionals contracted in for the duration of the course and not only tackle the background and reasons for being scared of flying, but also issues of claustrophobia, safety procedures and statistical data. Each step of flying is gently approached and explored using simulators if necessary and clients will be able to experience the different aspects of flying such as checking-in, boarding, landing and take-off without actually having to take a flight. How Much Are The Courses And Clinics? Costs vary widely around these options, with downloadable home courses being sold for around £20-£40 and full courses run by professionals being anything up to £300. The more professionals involved in the treatment the more expensive the treatment becomes. Whatever course or clinic the sufferer has chosen, always make sure that plenty of research into success rates, availability and service provided (including follow-up) has been carried out.